I bumped into some really cool keynotes at Super Mobility Week's MobileCON expo last week, and one of them was by Ben Elliott (@benelliott33), VP of BD at Kidozen, a leading provider of Backend-as-a-Service platform solutions to the world's largest organizations including DuPont, Boeing, and American Airlines. 1. The leap from device to applications management. 2. Consolidation of the enterprise mobile platform space. Today, the enterprise mobility ecosystem is highly fragmented and comprised of a myriad of segments such as MDM, mobile apps management (MAM), enterprise platforms, Backend-as-a-Service (BaaS), QA and testing frameworks, apps performance management (APM), mobile apps storages and distribution channels, mobile client app platforms, and others. But statistic shows that in the last 8 years venture funded startups have failed to demonstrate s sufficient traction for most of these areas and have generally lost the competition to powerful incumbents such as Amazon, IBM or Pivotal. Read more about mobile application development. The new trend suggests that PaaS vendors will expand their app management capabilities and mobile services via acquisitions, and top VC-funded startups will build towards more integral and complete platforms. This will gradually lead to consolidation within the mobile platforms market, with many standalone categories merging together. 3. Emergence of the new 3rd generation mobile platforms. As the enterprise mobile platform space is about to consolidate, requirements for business mobile solutions will become more sophisticated, with a greater focus on end-to-end solutions. So, we should anticipate a platform-based approach (frontend and backend centric) towards mobile apps QA and testing, performance monitoring and distribution, and towards those solutions that have failed to achieve sustainability in the recent years. Read more about mobile app development. 4. 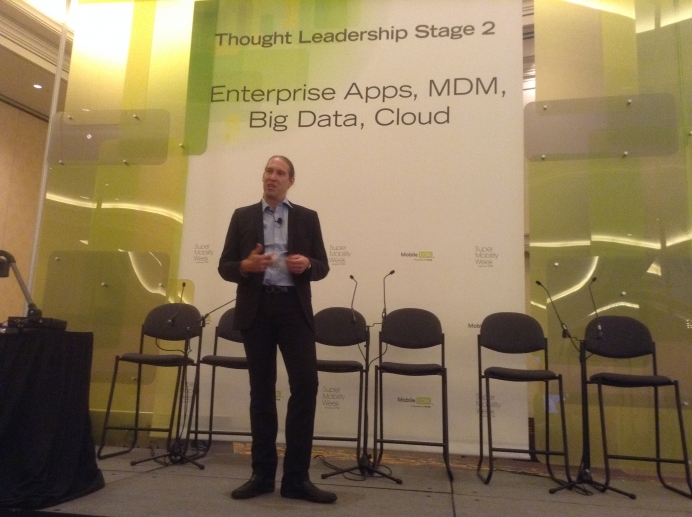 Data will become the new currency in the enterprise mobile world. As the Big Data evolves at an extremely fast pace these days, mobile apps are consuming it in many unpredictable ways due to the lack of expertise and best practices. As such, future enterprise apps will depend much on the auditing and regulations compliance and will be faced with totally new data privacy issues. In order to succeed, the enterprises will have no other choice but to understand their mobile users in predictable ways. To enable this, more efforts will be put into the user behavior research, with heavier investments to flow into the descriptive, predictive, diagnostic and prescriptive analytics. That said, mobile analytics solutions will most likely expand to machine-to-machine (m2m) communications and shift from mobile device to mobile apps and data management (as already mentioned above). 5. Evolution of the IoT backend service platforms. Today, every IoT startup builds its own backend infrastructure, but many fail to overcome the challenge of portability and interoperability. IoT is still lacking standards which greatly impedes investments in robust and innovative IoT solutions and restricts their mass market opportunities. We'll inevitably see deployments of the enterprise IoT solutions becoming mainstream thanks to the emergence of new IoT backend service platforms or transformations of the existing enterprise mobile platforms. These new platforms will focus on enabling better device management, device and solutions testing and apps performance monitoring. Read about ios app development. And it's already happening now, according to Ben Elliott. What other enterprise mobility trends would you add here?